Ryan decided to pursue writing seriously after having an epiphany while bicycling up the Rocky Mountains while on a 4,000-mile, cross-country bicycle trip in 1976. When she returned home, she set to work. She began using a deck of Tarot cards as an exercise, forcing herself to write a poem about the subject of whichever card she drew at random. Some of the subjects were harder than others. She follows in the literary footsteps of Elizabeth Bishop (brilliant, less out) who held the position from 1949-50 when it was called Library of Congress Consultant Poet. 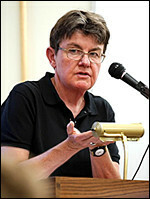 A great interview with Kay Ryan can be found here. I hadn't heard of her, but that makes it exciting. We will all be familiar with her work before too long.